After Gavilan College received renewal of its accreditation in 2013, a number of propitious changes occurred. The college underwent a transition in leadership when Dr. Kathleen Rose took the helm as Superintendent/President, adopted named years of focus, and oversaw publishing the Educational Master Plan in 2017 and Facilities Master Plan in 2018. 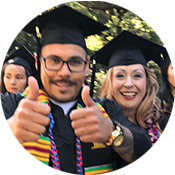 Gavilan College is eager to share its progress and to welcome a new accreditation visiting team March 11-14, 2019. “Accreditation means students can achieve their goals,” said Academic Affairs Vice President Denée Pescarmona. 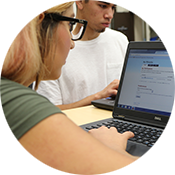 “Students can receive financial aid, and their units are guaranteed to transfer wherever their dreams take them.” California community and junior colleges receive accreditation through the Accrediting Commission for Community and Junior Colleges (ACCJC), Western Association of Schools and Colleges. Kicking off accreditation renewal with the ISER in fall 2017, the North South lounge filled with early participants enrolling into the process. The administration designated leaders for the four required standards. Those leaders built teams across departments campus-wide. 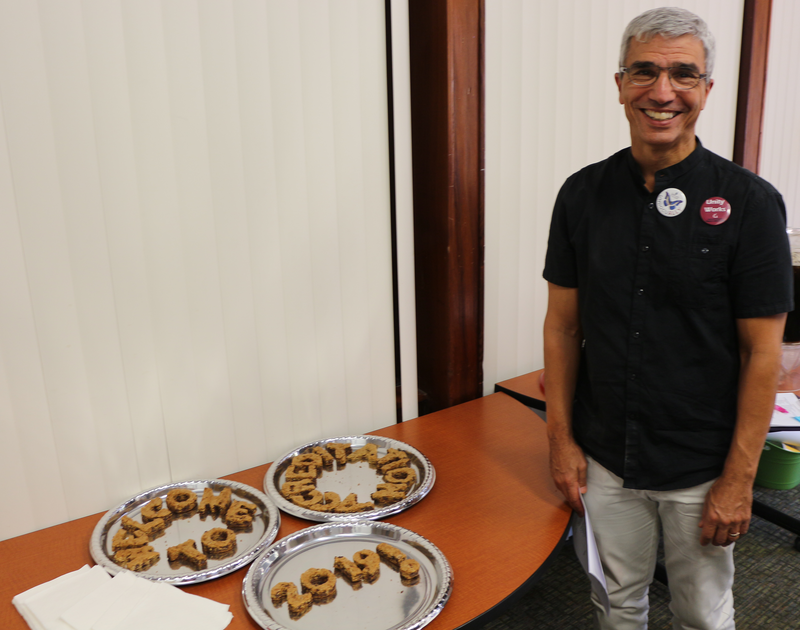 Ken Wagman brought his famous chocolate chip cookies, spelling out "Welcome to Accreditation 2019!" Wagman, faculty liaison leader, walked in the door of every meeting with his accreditation recruitment pitch. “People show up, every time,” he said. Wagman has worked with five Academic Affairs VPs on accreditation through his years at the college. To house the standards and the depository of documentation, Sabrina Lawrence, Distance Education Coordinator, built the accreditation website, available to participants as the content was assembled. produced by the Standards teams. Locally available on the intranet for months as participants added documentation, it is now a public document. The team revised the college mission, developed principles of community and core commitments, developed new institutional learning outcomes and revised long term planning documents. 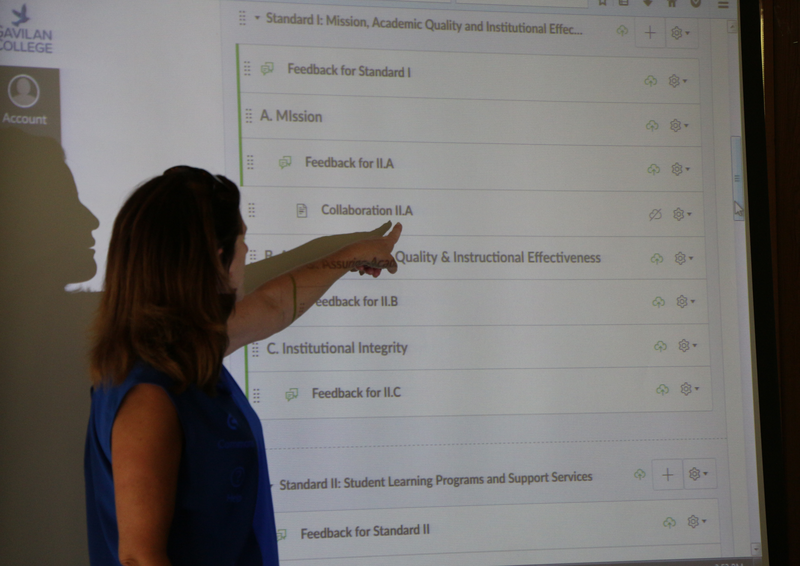 The team developed strong academic and student support services, developed programs committed to student learning, devised quality curriculum processes and codified strong policies and procedures focused on student success. The college draws on the resources of people, spaces, technology and money demonstrating how we serve students with fiscal stability, strong accountability and developing a new EEO plan. The college recognizes and uses the contributions of leadership throughout the organization to promote student success. Outcomes include a new shared governance handbook, improving implementation of practices, and effective CEO leadership. All four standards committees met regularly to discuss and gather the documentation supporting the college’s growth. More than 700 pieces of evidence were gathered, produced as physical copies, then pdf’d, linked and mapped to each standard. Team critical amassing all the evidence was Karl Sachtleben, Sydney LaRose, Jillian Wilson and Sandra Talavera. The accreditation team will want to talk with all departments, visit classrooms and online classes, and especially talk with students on all five district campuses. Accreditation forums will be held in the next few weeks before the visiting team arrives. The Gavilan College Board of Trustees will meet on March 12 at the Coyote Valley campus. The accreditation team may also attend the Trustees meeting during their visit.